Whether it's a relaxing or adventurous holiday that you want, homestays and bed & breakfasts in Goa are a great alternative to the usual beach hotels. It's at a homestay that you can really get away from the crowds and enjoy the calmness of the villages. These top Goa homestays, for all budgets, will give you a warm welcome and memorable experience of the true local Goan way of life. Do note that the rates stated below are the cheapest throughout the year and may increase significantly during the busy tourist season. 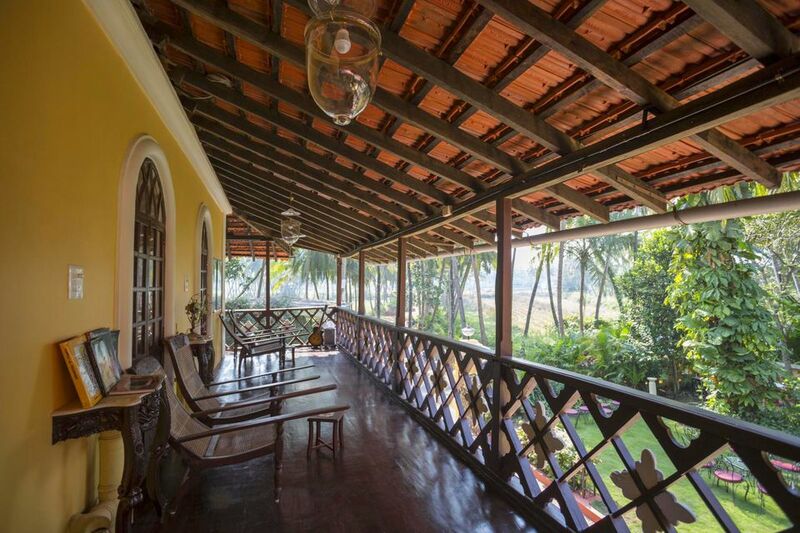 Arco Iris is the perfect place for anyone with a passion for Goa's old Portuguese mansions. This one took three painstaking years to restore to its previous grandeur, but the result is stunning. The gorgeous mosaics are a special feature. The property fronts onto a seasonal lake, which makes the setting even more captivating. Situated in the quiet village of Curtorim, not far from Margao in south Goa, it's convenient for visiting other restored Portuguese mansions that are open to the public as well. Expect to pay around 5,000 rupees per night upwards for a double, including breakfast. Capella is a classic boutique Goan homestay, nestled on a forested hill in Parra village, about 15 minutes inland from Anjuna and Baga. The hosts are avid nature and wildlife enthusiasts, and have a vast collection of books on the subject. They designed and built the property themselves, and it oozes earthy character.﻿ There's a swimming pool and three air-conditioned guest rooms. Rates start from 4,500 rupees per night, for a double including breakfast. Olaulim Backyards is a hinterland homestay with five unusual eco-friendly cottages, where you can really get back to nature. The property sits along the Goan backwaters in Olaulim village near Aldona, about 30 minutes inland from Panjim. It's ideal for those who like an active vacation enjoying the great outdoors. Options include kayaking, village walks, and bird watching. Special scuba diving and monsoon white water rafting packages are also available for adults who like a thrill! Plus, the property has a swimming pool, tree house, and menagerie of pets. Rates start from 4,500 rupees per night. Breakfast and all in-house activities are included. The magnificent 300-year old ancestral home of the Menezes family is surrounded by paddy fields and palm trees in Batim village, about 20 minutes southeast of Panjim. The village feels wonderfully stuck in time. Nearby, a lake is a delight for bird watchers, and bicycles are available to explore the surrounding area. The host is very knowledgeable about its heritage and history. The property also has an art gallery and boutique (Sala de Kala). It showcases the work of artists from Goa and beyond, as well as stocks antiques and other unique items of furniture. Frequent exhibitions are held at the gallery. Pets are welcome! Expect to pay 4,500 rupees per night upwards for a double. Idyllic and immaculate, The Secret Garden stuns guests with its thoughtful restoration that took more than a decade to complete. The property is situated in Saligao village, around 10 minutes from Baga beach. It combines old and new, to create a magical tropical hideaway in a much loved 200-year old ancestral home. The Goan-British hosts have extensive tourism experience in Goa and this is reflected in their outstanding hospitality, including sumptuous breakfasts. The largest of the three exquisitely decorated guest rooms opens out onto the garden and has a path leading to the swimming pool. Rates start from around 6,000 rupees per night. A minimum two night stay is required. Also in Saligao village, Quinta da Graça is an atmospheric Indo-Portuguese mansion, dating back to the 1940s. The hosts are a local couple who have restored the property with some additions, but largely keeping its Goan essence intact. Expect rooms with high ceilings, antique Belgian crystal chandeliers, period furniture, and a serene walled garden surrounding the house. The hosts have a keen interest in Goan folklore and culture, and have plenty of entertaining stories to share. The guest accommodations consist of four bedrooms, a separate one-bedroom cottage, and a two bedroom cottage. Rates start from 2,500 rupees per night for a double room. Very family and child friendly, Cancio's House provides laid-back accommodations in the 500-year old ancestral home of a sweet Goan family and their pets. It offers a traditional village and eco-friendly experience in Aldona. Water is drawn from a well and food is cooked using home grown produce. The hosts organize kayaking on the backwaters. You can also charter a speedboat or catamaran. Rates start from 2,800 rupees per night upwards. Caravela Homestay is ideal for anyone wanting to stay in Goa's Fontainhas Latin Quarter. Tucked away in one of the district's Portuguese mansions, it's themed on a 15th century Portuguese ship. The father and son hosts are really kind and helpful, and the property also has a cafe that serves delicious Indo-Portuguese cuisine. There's a wide range of rooms to choose from including single, family and suite rooms. The suite has its own rooftop terrace. Rates start from around 2,500 rupees per night. This leafy, value-for-money homestay is centrally situated in the quiet Campal Heritage Precinct, close to Miramar and the Mandovi River promenade. Its affable host will make you feel welcome and settled. He even gives guests a short tour of the area. The International Film Festival of India is held at Campal, and the Kala Academy center for performing arts is nearby. In addition, the Goa Carnival parade passes through the area. The property is a refurbished 100-year old Indo-Portuguese mansion with four basic rooms for guests. Expect to pay 2,000 rupees per night for a double, including breakfast. Bright and cheery, and looking out across rice paddy fields about 10 minutes from Benaulim beach, Simply Homestay blends Goan and western influences. The hosts are a multicultural husband and wife team -- he's Goan and she's German/Slovenian but grew up in Switzerland -- plus their two young kids. They work in the travel industry and offer a diverse variety of activities. There are only two guest rooms (one with double bed and the other with two singles) in a building separate from the main house, so you'll have plenty of privacy. Expect to pay 3,000 rupees per night, including breakfast.